When preparing to move, one of the most important things that should be at the top of your moving checklist is to acquire moving boxes. There are numerous options for obtaining boxes—secondhand, your professional moving company, stores, etc. While it is not recommended to use secondhand boxes, they will work in a pinch. No matter where you get your boxes, you’ll have the daunting task of trying to determine just what to do with them once you have moved into your new home. If boxes are still in pretty good shape, and are carefully stored after moving, these boxes contain a second life. Below we’ve outline some popular ideas of things you can do with moving boxes after you’ve unpacked everything! Used moving boxes are great for providing extra storage. Moving boxes make great storage solutions for your attic, basement, or garage for non-seasonal clothing, decorations, and any other miscellaneous items that you don’t use regularly throughout the year. Moving boxes are also a great way to send care packages to distance friends and relatives. If you know that you are going to be moving again in the near future, store the boxes (after you’ve broken them down), you can cut them up and use them as padding to wrap sharp and fragile items. Boxes that can’t be used again, but aren’t soiled should be recycled. Be sure to break down your boxes before tossing them into a recycling bin. Check with your local municipality for recycling guidelines, regulations and pick-up schedule. When unpacking, take note of the condition of your boxes. Any boxes that are torn, soiled, bent, or have been exposed to the elements should be thrown out. This also goes for any boxes that have been contaminated by bugs or other pests, or come in contact with dangerous chemicals or mold. Remember to break down the boxes prior to throwing them out. People are always looking for moving boxes for cheap. 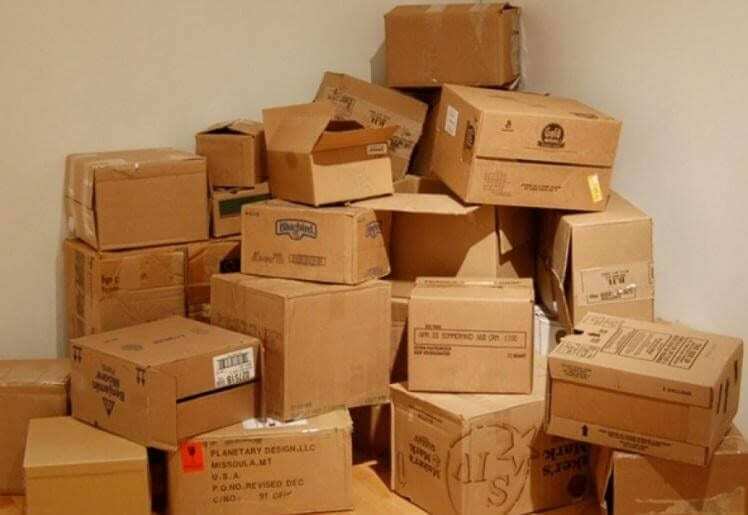 If your boxes are in decent shape and can be used again, try selling your boxes. Asses your boxes and place an ad in your local classifieds, or online marketplace and earn a couple dollars for selling your gently used moving boxes. Another great use for used moving boxes is to get creative and use your imagination. Boxes can be cut up and used to create household items and trinkets, such as planters, coasters, gift tags, and more! The possibilities are endless. Boxes can also be turned in to a playhouse and other fun toys for young children to spend hours playing with. Now that you know some of the ways that you can get rid of your used moving boxes, you can confidently cross “get ride of boxes” off your moving checklist. If you are in need of packing supplies, White Glove Moving & Storage has packing supplies for purchase and rent to ensure that you are able to pack your home. If you would prefer to not have the added stress of packing, White Glove Moving & Storage also has packing services available. Contact us today to get a free quote for packing services.